Teaching is a great job, if you love kids, helping people learn, improving your own teaching through learning, and holidays. You wouldn't go into teaching for the holidays, but they are part of the job and they are a regular bonus and something to look forward to when the going gets tough. Almost every teacher I know, though, spends part of every holiday preparing for the next term - setting up their classroom, preparing lessons and units of work, researching best practice, meeting colleagues to plan the best they can for their students. I'm lucky - as a Learning and Teaching Coach I have no students to plan for but I will always read, research and plan during the holidays - even if it is from a boat on the water instead of in a school! The summer holidays were full of boating trips where we could swim and walk to the beach in our shorts and hats, collecting shells, swimming with the fish, finding shady spots for reading a book. Four weeks flew by as we relaxed in the warmth and worked on our tans, ate seafood and salads as often as possible, and enjoyed an after dinner drink as the sun went down. Ten weeks on and the holidays are different - daylight saving has finished, so sunsets are enjoyed before dinner, scattered showers have replaced sunny skies, swimming is not an experience we would choose. Instead of swimming, we walk along tracks through the bush, meeting kangaroos, hearing the multitude of birds in the trees all around. Books are enjoyed in the cabin or on the Flybridge out of the breeze in a sunny spot when one can be found. Casseroles and roasts have replaced seafood and salad. The TV is our entertainment after dinner, when it is dark and cool outside. 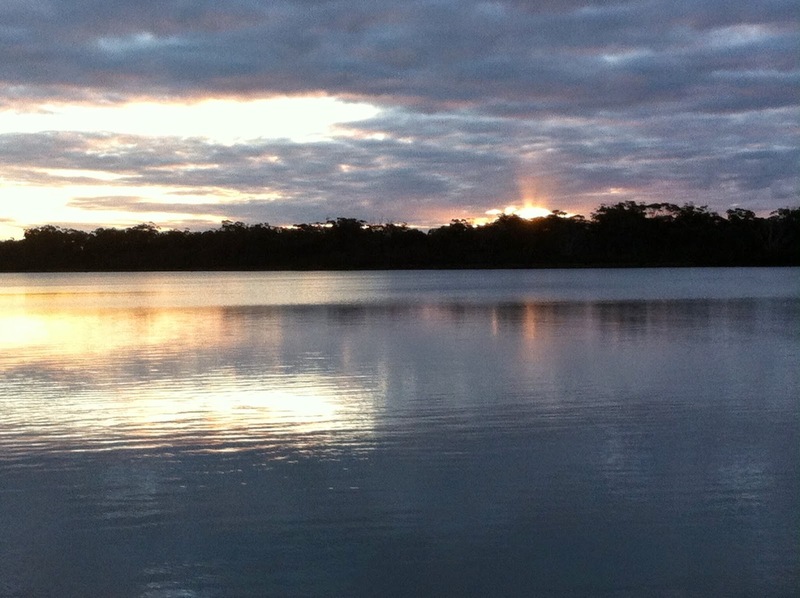 But one thing doesn't change, ten weeks on - the love we have for boating, especially around the Gippsland Lakes. The Captain will bring the boat closer to home for the winter after these holidays finish, and we will look forward to many boating experiences in the bays of Melbourne until warm weather returns and we can enjoy the lakes again.